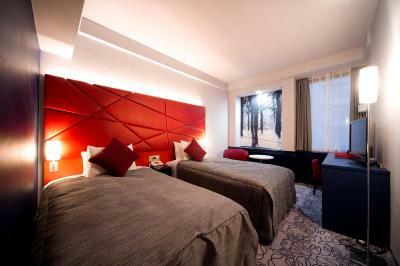 Lock in a great price for Shiba Park Hotel – rated 8.4 by recent guests! Great location to get around the city. Stayed in the new block, & the rooms by Japanese standards is large. Clean & cosy with good amenities in room. Beds are comfortable. Hotel staffs are helpful. Gd service. Will stay here again, the next time I visit Tokyo. The room was big by Japanese standards. The bathroom had a separate toilet and shower area. There are three stations nearby including a JR rail station. Along the walk there are many places to eat and shop. Activities - furoshiki and origami and all the extra things like washing facilities, computer etc also steak restaurant was great - food and service was exceptional. it would be nice if hotel provides daily complimentary bottle water to guest per stay. It is center of tokyo, easy to access other location. Bf is good. Great and friendly service. Very attentive and helpful. They stored our luggage at no extra cost while we were traveling in Japan for five days. Nice room and great bathroom amenities. The location was very good- close to the subway and close to many restaurants. The room had a good size, bigger then expected. The staff was very helpful. The breakfast was good. I liked the location and the hotel was clean and quiet, staff very helpful. I have stayed in the annex building in a not renovated room which might be a bit old style. But the hotel has new modern refurbished rooms that are great. The breakfast buffet was very good with a great variety of food. The hotel is closed to Hamamatsucho station so it is very convenient to stay here when you arrive at the Haneda Airport. It’s also in a walking distance of Daimon station. The room is clean and comfortable. The staff is very helpful and responsive. Shiba Park Hotel This rating is a reflection of how the property compares to the industry standard when it comes to price, facilities and services available. It's based on a self-evaluation by the property. Use this rating to help choose your stay! One of our top picks in Tokyo.Shiba Park Hotel is just a 2-minute walk from Onarimon Subway Station and a 4-minute walk from Daimon Subway Station. The spacious rooms include a flat-screen TV and free Wi-Fi is available at all areas. Public parking space is available on site at an additional charge. Guests can wiggle their toes in the comfortable slippers and enjoy the air-conditioned comfort in some guestrooms. Air conditioning temperature is centrally controlled by the property. Each room at Shiba Park Hotel includes a private bathroom. JR Hamamatsucho Train Station is an 8-minute walk from the hotel. Tokyo Tower, Zojo-ji Temple and Atago Shrine are a 10-minute walk away. 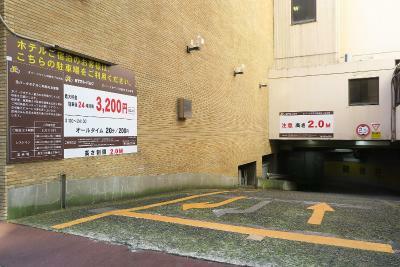 Nearby stations offer direct links to Akihabara and Asakusa. Guests can plan sightseeing at the tour desk, or unwind with a traditional Japanese-style Shiatsu massage. Free amenities for babies are available upon request. A Chinese menu is on offer at the elegant Peking. The hotel also houses Bar The Fifteen's. For breakfast, guests can enjoy a Western and Japanese-style buffet breakfast. When would you like to stay at Shiba Park Hotel? This spacious room includes a flat-screen TV and a private bathroom with slippers. Both WiFi and high-speed wired internet is available in this room. This spacious room includes a flat-screen TV and a private bathroom with slippers. Free high speed wired internet is available. Both WiFi and wired internet is available in this room. Features hollywood twin beds (twin beds placed side-by-side, without a space between them). This spacious room includes a flat-screen TV and a private bathroom with slippers. Both WiFi and high-speed wired internet is available in this room. The spacious room includes 4 single beds, flat-screen TV and a private bathroom with slippers. Both WiFi and high-speed wired internet is available in this room. This spacious room includes a flat-screen TV and a private bathroom with slippers. Both WiFi and high-speed wired internet is available in this room. The property will allocate a unit to the guest on arrival; decor styles are subject to availability. This spacious Superior Twin Room arranged with 1 extra bed to make Superior Triple Room. Room includes a flat-screen TV and a private bathroom with slippers. Both WiFi and high-speed wired internet is available in this room. The property will allocate a unit to the guest on arrival; decor styles are subject to availability. This air-conditioned Hollywood twin (twin beds placed side-by-side, without a space between them) room features a taste of Japanese culture in colors, decoration, and lighting and free WiFi. A closet, flat-screen TV, electric kettle and seating area is available. Complimentary coffee, tea and shortbread is offered. This air-conditioned double room features a taste of Japanese culture in colors, decoration, and lighting and free WiFi. A closet, flat-screen TV, electric kettle and seating area is available. Complimentary coffee, tea and shortbread is offered. 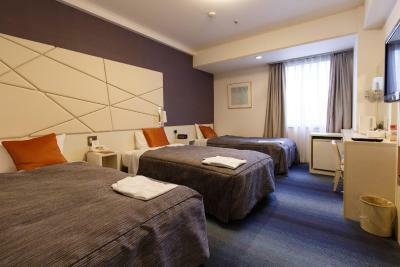 This air-conditioned triple room features a taste of Japanese culture in colors, decoration, and lighting and free WiFi. A closet, flat-screen TV, electric kettle and seating area is available. Complimentary coffee, tea and shortbread is offered. 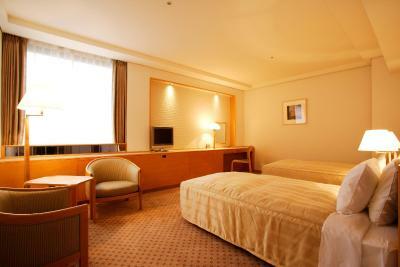 Shiba Park Hotel is a great located in the heart of Tokyo. 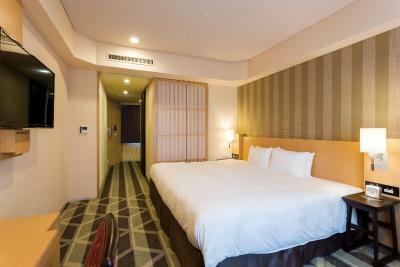 This Tokyo budget hotel has great access to 4 major train and subway stations, and is close to Tokyo's major sightseeing spots as well as the business districts. 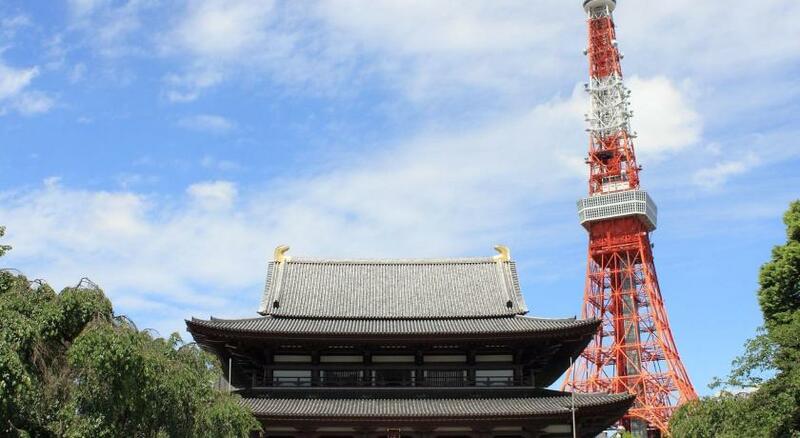 The famous Tokyo Tower and the beautiful temple (Zojoji) are just a few steps away. There is a Michelin star getter in this hotel for your inhouse dining, but if you love to eat out, there are hundreds of little great restaurants around this hotel in Minato-ku, Tokyo. House Rules Shiba Park Hotel takes special requests – add in the next step! Shiba Park Hotel accepts these cards and reserves the right to temporarily hold an amount prior to arrival. Please be informed that bookings of 5 rooms or more, and bookings which exceed 15 room nights or more will be treated as group bookings.Different policies and additional supplements may apply. Please contact the property directly for more details. Did not take breakfast. Location was a bonus as it is quite close to the Tokyo Station. Great location, nice and quiet area close to Hamamatsucho station so easy to get to from Haneda and easy to get around especially on the JR Yamanote line. Staff were brilliant and especially towards our young son, great hotel for families can not recommend enough. Free cultural activities. We did origami with Yuma and Yuka and that was great. Both ladies were happy to chat and give travel advice about Tokyo and Kyoto. Good variety in the onsite vending machines and handy ice machine on our floor. Staff at Grill at first floor. Simply lying with respect to table availability. Location; near subway and railway stations. Room was a bit small and breakfast a little pricey. The location 15 mins from the station by taxi is ideal; also close to a number of convenient eateries. Staff were attentive and friendly.. There seemed to be a strange mix of amenities depending on your floor or building. In the annex, I had air con in my 8th floor room, while my parents didn’t on the 11th floor. I met a couple in the lift who were staying across the corridor from me who didn’t have WiFi while mine was great. Apparently the 12th floor had safety deposit boxes, and all the rooms in the main building, but not any other floors in the annex. A strange lack of consistency. Tokyo is expensive, so I didn’t expect luxury, but these are good things to be aware of. Very friendly staff who couldn’t do more to help. Incredibly clean and reasonably quiet. Also a good spot from which to explore the city, though the area is quite quiet in the evenings if you’re looking for more options to eat out. Breakfast was very ordinary. Tepid (hot) food, poor selection of western style food. All food was pre-cooked and re-heated. The toaster was the slowest I have experienced anywhere. We ate breakfast once in the hotel and did not return again. Great location in quieter part of Tokyo. Largest room I could find out of 28 hotels considered in Tokyo. We had dinner at the hotel Chinese Restaurant - Peking. It was really excellent for food and quality service. The hotel was near 4 different subway stations in easy walking distance, which made travel around Tokyo really easy. Not quite ideal for the main metro lines. We didn’t originally plan on staying at the hotel but it was an excellent surprise. The staff were very helpful and the room was practical and comfortable. A nice location, too, near the Tokyo tower. Big and clean room, very good and friendly hotel staff, close to metro stations. The JR line is a 12 minute walk away. The walk is easy and straightforward but we were traveling with my mother so it was a bit far for her. Chinese restaurant - would not recommend. Food was tasteless and service was poor.